In order to shoot well, shooters must exercise excellent “sight alignment” and “trigger control,” both at the same time! Trigger control is important because the gun is held in one hand, at the end of an outstretched arm, and and “fault” in trigger control can easily cause a perfectly aimed shot to miss the target center by a substantial margin. The bullseye league at WAC meets every Thursday evening at the bullseye range, where a 60-shot course of fire is completed – 20 shots each of slow, timed, and rapid fire. On the first, second, and (sometimes) the third Sunday of the month, an “1800,” consisting of two 900s, is fired, typically with a .22 and a centerfire pistol, often .45 caliber. There is also bullseye training for juniors, on the first and third Thursdays of the month (check the monthly calendar), on the Public Line, immediately after the regular bullseye league. (Although the club calendar includes a “senior bullseye league,” that is not in operation). There is no need for new participants to worry about their score, because no scoring is done, except that shooters might keep a record of their own scores. For this reason, there are no scores reported in this newsletter, even though many people participate! 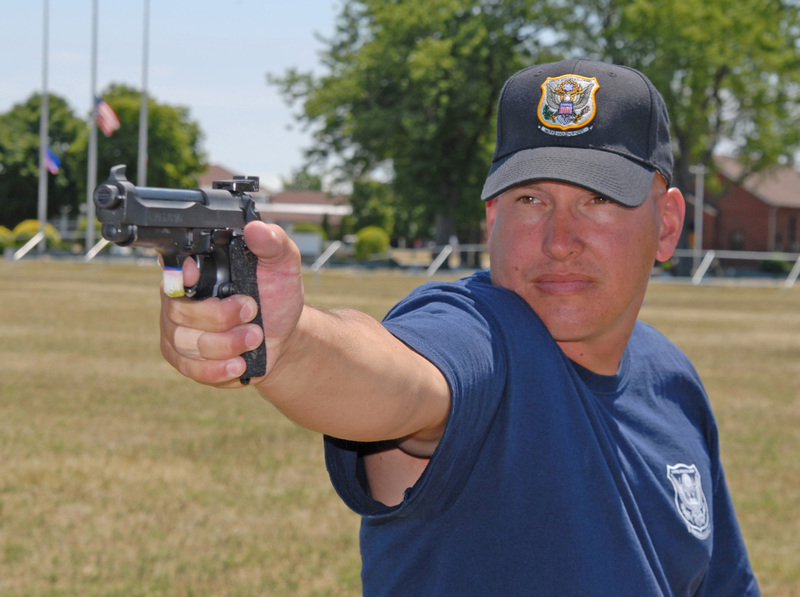 The National Pistol Championship is conducted at Camp Perry, Ohio, in July, along with Smallbore and High Power Rifle Championships. A Bullseye match consists of 90 shots, comprised of 30 shots each, of slow fire, timed fire, and rapid fire, for a total possible score of 900 (which no one has ever shot). Slow fire can be fired either at 50 yards or 25 yards (depending on the range and match rules) and timed and rapid fire are fired at 25 yards. In slow fire, 10 shots are fired in 10 minutes. In timed and rapid fire, strings of five shots are fired in 20 and 10 seconds, respectively. Targets are scored after 10 rounds. All of the participants shoot at the same time (subject to range capacity) and shooters score the other shooters. A bullseye 900 takes 1 1/2 to 2 hours to complete. We invite you to come and see what shooters are doing when they shoot bullseye. In order to shoot, you must be “qualified,” meaning that you have previously participated successfully in bullseye at WAC, or else you must become qualified by demonstrating that you can keep all of your shots in the bullseye scoring rings in slow, timed, and rapid fire.